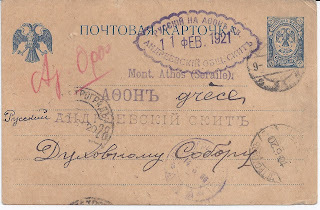 The card is addressed to the largest Russian Orthodox community on Mont Athos, the Andreevsky (St Andrews) Sekte - in reality, a monastery but called a "Sekte" because it was created too late to qualify for monastery status. Before 1914, several hundred monks lived there, and the large buildings still exist. 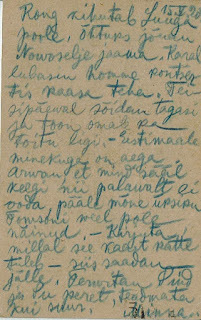 The card would have travelled up to Archangel / Murmansk and then across the White Sea to Vardo in northern Norway, then down through Norway for onward transmission. This was the only route out of Bolshevik Russia available in June 1920. This is no doubt a main reason why it took until 11 February 1921 for this card to arrive at St Andrews, an arrival indicated by the violet cachet at the top of the card. 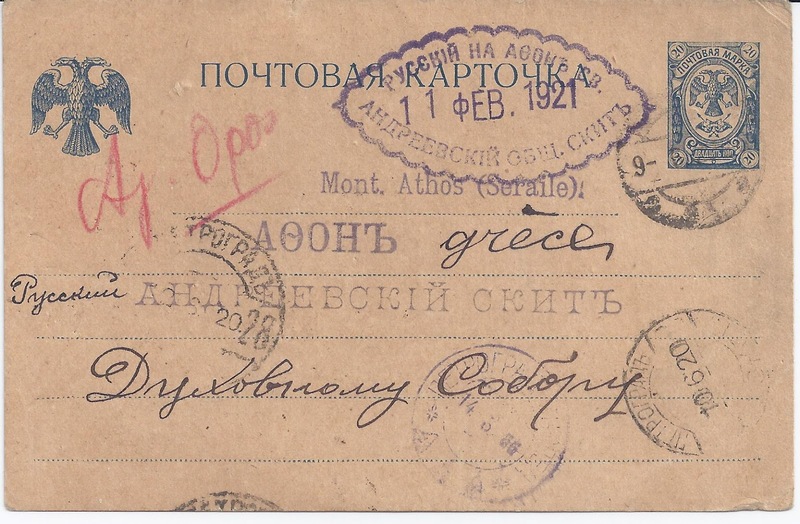 The confused address has been clarified, probably on arrival in Greece, with a red annotation in Greek which abbreviates the Greek Agion Oros for "Holy Mountain" in order to indicate the destination. 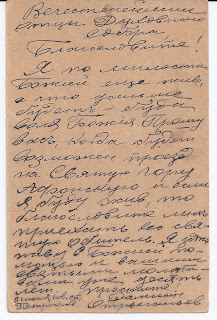 Mail from Bolshevik Russia going abroad in the second half of 1920 is rare. This early item is particularly nice. Added 9 July: Alexander Epstein has posted a Comment below which adds further information. British readers (in particular) might like to know that Mount Athos though part of Greece and therefore part of the European Union is exempt from the EU's "Free Movement" requirements - this is written in to Greece's accession treaty. A visa is required to visit and you must be male and preferably Orthodox to get one. 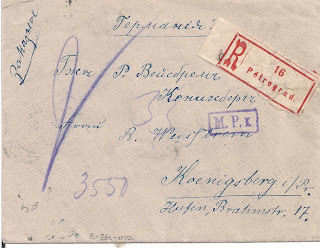 Vasilis Opsimos has submitted an interesting item from June 1920, a Registered letter from Petrograd with multiple cancellations of 12 June, arriving three months later in Koenigsberg with a typical boxed violet M.P.k Koenigsberg Censor mark and an arrival cancellation. BUT the franking is a mystery. 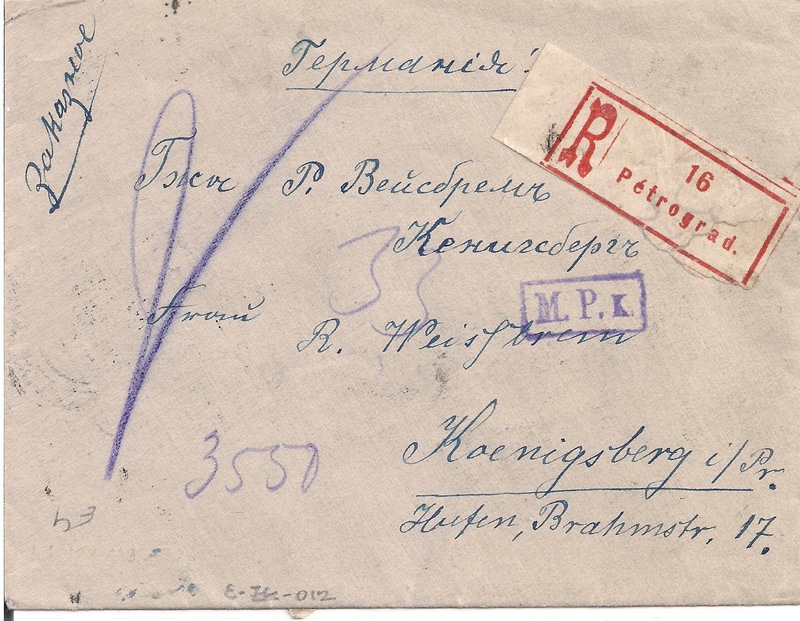 The new Foreign Tariff specified 10 roubles for a Registered letter. 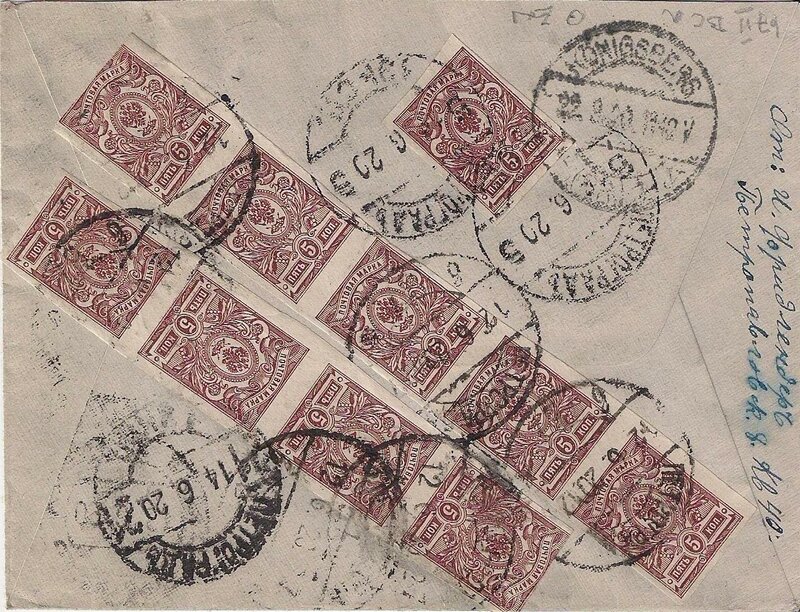 Since 5 kopeck stamps were revalued x 100 in the Spring of 1920, this cover is franked at 50 roubles. Suppose the clerk forgot the revaluation, then 50 kopecks is not a Tariff either. 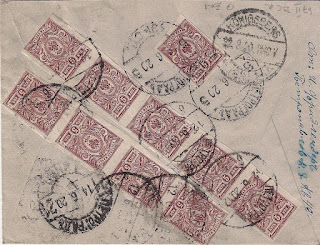 The only explanation I can think of is that the sender put the stamps on before going to the post office, thought they added to 50 kopecks and remembered that this was the Internal Registered letter rate in 1919 .... But I am not convinced by my own story. 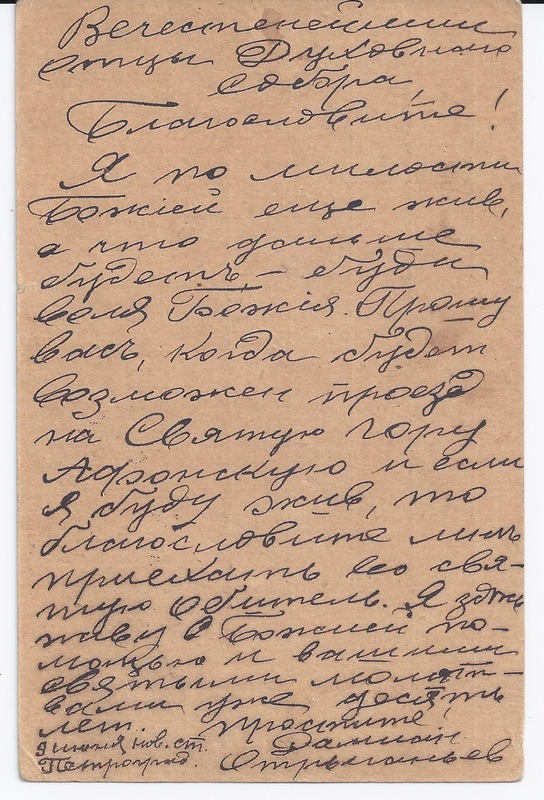 Labels: Andreevsky Sekte Mont Athos 1920, mail to Mont Athos, RSFSR mail abroad, RSFSR mail abroad 1920, Russian post Mont Athos. Really. a very interesting card. And mailed very soon after the opening of mail exchange with abroad. 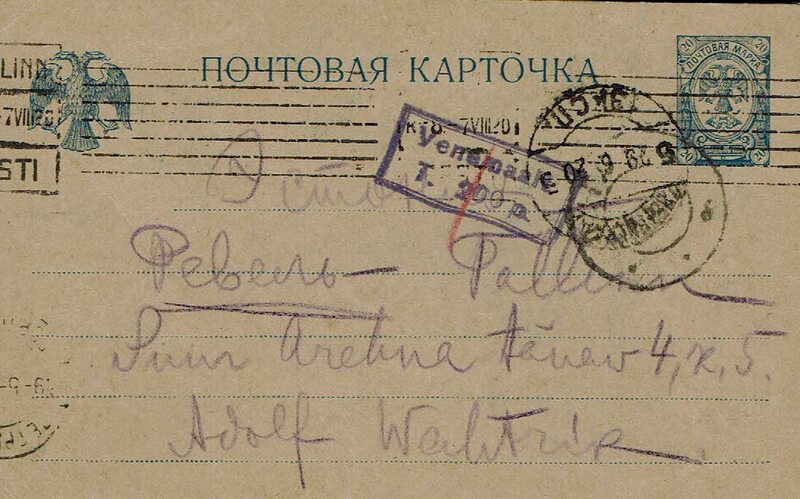 For me too, it is the earliest cover sent abroad, at least, from Petrograd. True, I have a similar blue postcard posted still earlier, I.e. 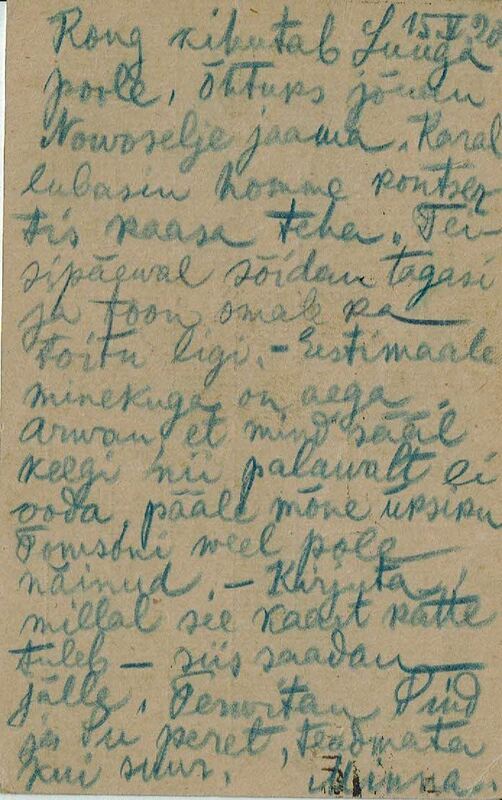 on 15.5.20 from Luga, I.e. when the way abroad was not opened yet. Probably there were already rumors on this matter among the population. 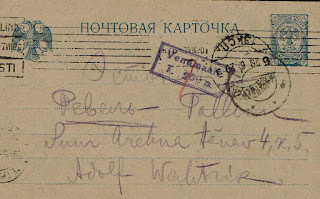 However, it was first handled in Petrograd as late as 19.6.20 and left it on 29.6.20 evidently via Murmansk and Vardö. A little later, there was opened one more way of forwarding mail abroad, I.e. via Odessa on an italian ship. Therefore, one cannot exclude the possibility that your card was directed first just to Odessa. In such a case, the way to the addressee might be long as well.